In November, the Office of Management and Budget’s Office of Information and Regulatory Affairs (OIRA) released its Fall 2014 Unified Regulatory Agenda, reflecting revised projected publication dates for rulemaking initiatives of the Pipeline and Hazardous Materials Safety Administration (PHMSA). The Department of Transportation’s November Significant Rulemaking Report also reflects the revised dates for PHMSA’s rulemakings. The table below reflects the updated information. Revised dates appear in bold. Significantly, OIRA now projects that PHMSA’s proposed rule on the safety of gas transmission lines will be published before the proposed rule addressing on-shore hazardous liquid lines. On November 20, the Federal Energy Regulatory Commission (FERC) issued a proposed Policy Statement regarding Cost Recovery Mechanisms for Modernization of Natural Gas Facilities. The proposed Policy Statement would permit interstate natural gas pipelines to establish a tracker or surcharge mechanism to recover facility upgrade costs related to anticipated pipeline safety, reliability, and environmental regulations, if certain standards are met. The proposal represents a modification of FERC policy, which previously rejected pipeline safety and environmental cost trackers that were not agreed to as part of a unanimous settlement with the pipeline’s customers. For additional information on the proposed policy, see VNF’s issue alert here. Initial comments on the proposal are due December 26, 2014, and reply comments due January 15, 2015. PHMSA is accepting applications for State Damage Prevention program grants. PHMSA is accepting applications for grants to support eligible State Damage Prevention programs. Applications are due January 26, 2015. Further details are available here. DOT Office of Inspector General releases report on top management challenges. On November 17, DOT’s Office of Inspector General (OIG) issued a report identifying DOT’s top management challenges for the 2015 fiscal year. The report highlights OIG’s recent review of PHMSA’s State Pipeline Safety Program, which found a lack of effective management and oversight. Challenges to PHMSA include providing guidance to states on how to consider risk factors when scheduling inspections; adequately assessing state inspection procedures and compliance with program evaluation requirements; and auditing grant funds. The report notes that PHMSA is implementing a new training program for PHMSA evaluators reviewing state safety programs. PHMSA maintains 25% random drug testing rate for 2015. On November 17, PHMSA published a notice that it will continue to require operators to perform random drug and alcohol testing for a minimum of 25% of covered pipeline employees during 2015. The testing rate remains unchanged because the random drug test positive rate for the calendar year 2013 was less than one percent. PHMSA also stated that user names and passwords necessary to access the online Drug and Alcohol Management Information System (DAMIS) will be available to operators with access to the PHMSA Portal in late December 2014. Presentations from PHMSA’s NPMS public meeting are available. Presentations from PHMSA’s November 17 public meeting on the proposed information collection relating to the National Pipeline Mapping System are available here. Comments on the proposal, which were due December 1, are available here. PHMSA announces new R&D initiatives. 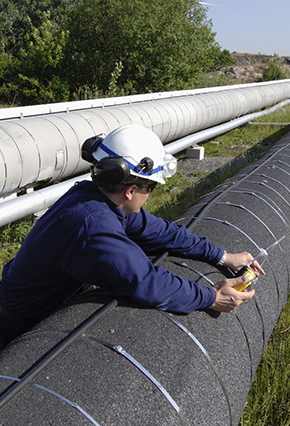 PHMSA has announced several new research and development initiatives, including research aimed at improving pipeline coating and reducing and preventing corrosion. Projects are listed here. Presentations from the Pipeline Safety Trust 2014 Annual Conference are available. On November 20 and 21, the Pipeline Safety Trust convened its 2014 Annual Conference in New Orleans. Speakers included officials from PHMSA and other federal, state, and local government agencies; industry representatives; and members of the public. Copies of presentations and webcast videos are available here. NEB engagement initiative on pipeline safety. On November 25, Canada’s National Energy Board (NEB) announced a “cross-Canada engagement initiative” in which NEB will visit all provinces and northern territories to solicit input on how NEB can improve its pipeline safety program. The initiative will also include an online discussion forum, which can be accessed here. The NEB intends to host a pipeline safety technical conference after visits are concluded in late spring 2015, and issue a public report in early 2016. *SB18 (Hill): This bill would authorize the California Public Utilities Commission (CPUC) to require that the $1.4 billion fine proposed by CPUC administrative law judges against PG&E for violations relating to the 2010 San Bruno accident be held in a separate account and not deposited into the state’s General Fund. Most of the funds would be used to offset investments in pipeline replacements in the company’s service territory that otherwise would be recovered from rate payers. A portion of the funds also would be allocated for an independent monitor to oversee the company’s pipeline operations and to provide seed money for a pipeline safety trust. The bill was referred to the Committee on Rules. The Illinois Commerce Commission has proposed to amend its gas pipeline safety regulations to (1) incorporate by reference the federal pipeline safety rules in effect on October 1, 2014, and (2) require the electronic submission of plans, procedures, and programs that are submitted to the agency. Comments on the proposed amendments are due December 22, 2014. *On November 10, the North Dakota Public Service Commission (PSC) issued a notice that it is proposing to amend its pipeline safety regulations to include PHMSA’s regulatory requirements adopted through November 6, 2014. The PSC is also proposing PHMSA’s Part 195 regulations applicable to hazardous liquid pipelines. The PSC will convene a public hearing on the proposed amendments on December 15, 2014. SB No. 378 (Coley): The bill would, among other things, (1) provide the Ohio Public Utilities Commission (PUC) with authority to enforce the state’s one-call utility protection requirements; (2) set forth complaint and enforcement procedures for alleged non-compliance with one-call requirements; and (3) create an Underground Technical Committee to coordinate with the PUC in administering one-call requirements, receive and review PUC reports on complaints of alleged non-compliance, and recommend remedial action. *The Railroad Commission of Texas is conducting a survey of pipeline operators of Class 1 and rural gathering pipelines to better understand the risk the lines pose to the public. The survey is part of the process of implementing House Bill 2982, which delegated authority to the Commission to regulate transportation and gathering facilities for gas in Class 1 locations and hazardous liquids and carbon dioxide in rural locations. Responses are due January 30, 2015. The survey is available here.